1983-04-08. New. Ships with Tracking Number! INTERNATIONAL WORLDWIDE Shipping available. Buy with confidence, excellent customer service! 1997-07-04. Good. Ships with Tracking Number! INTERNATIONAL WORLDWIDE Shipping available. May not contain Access Codes or Supplements. May be ex-library. Shipping & Handling by region. Buy with confidence, excellent customer service! 1984-06-01. New. Ships with Tracking Number! INTERNATIONAL WORLDWIDE Shipping available. Buy with confidence, excellent customer service! 2008-07-04. New. Ships with Tracking Number! INTERNATIONAL WORLDWIDE Shipping available. Buy with confidence, excellent customer service! 1997-07-08. New. Ships with Tracking Number! INTERNATIONAL WORLDWIDE Shipping available. Buy with confidence, excellent customer service! 1993-02-04. Good. Ships with Tracking Number! INTERNATIONAL WORLDWIDE Shipping available. May not contain Access Codes or Supplements. May be ex-library. Shipping & Handling by region. Buy with confidence, excellent customer service! Oxford University Press, USA, 1983-07-28. Hardcover. Used:Good. Cary, North Carolina, U.S.A.: Oxford Univ Pr -, 1983. Gd. 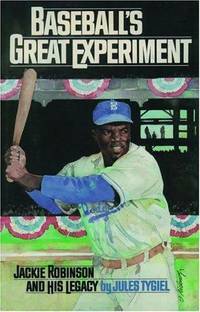 condition - A exploration of Jackie Robinson as first blackman in national baseball league ... ... (AH5527ml). Hard Cover. Good. Oxford University Press. PAPERBACK. 0195339282 BRAND-NEW, Unread Copy in Perfect Condition. FAST FedEx shipping (you'll receive your order within 1-5 business days after shipping in most cases*), this helps to ensure your order arrives in perfect condition. PLEASE NOTE: FedEx does not generally deliver to PO Boxes or APO addresses, so please be sure to give us a physical street address to deliver to; also, unfortunately, we cannot ship this item to Alaska or Hawaii. THANKS! *(this applies to domestic shipments within the continental US - other destinations may take longer) . New. New York: Oxford University Press, 1983. Third printing. Hardcover. Fine copy in Near Fine dust jacket with light wear to edges, light shelf-rubbing and 1/4" closed tear on top DJ cover; else excellent copy; Signed/Inscribed by author on front endpaper; pages are bright and free of marks, bumps and creases; binding is solid./near fine. Octavo in offwhite cloth boards in black illus. dust jacket; 392 p.,  p. of plates: illus. ; 24 cm. Signed/Inscribed by author on front endpaper. Oxford University Press. PAPERBACK. 0195106202 New Condition. . New. Oxford University Press. Hardcover. 0195033000 New Condition. . New. Vintage. PAPERBACK. 039472593X New Condition. . New. 1983-04-08. Good. Ships with Tracking Number! INTERNATIONAL WORLDWIDE Shipping available. May not contain Access Codes or Supplements. May be ex-library. Shipping & Handling by region. Buy with confidence, excellent customer service! 1997-07-08. Good. Ships with Tracking Number! INTERNATIONAL WORLDWIDE Shipping available. May not contain Access Codes or Supplements. May be ex-library. Shipping & Handling by region. Buy with confidence, excellent customer service! Oxford University Press, 2008. Paperback. New. 5.3 x 7.9 cm. Oxford University Press, USA, 1993-02-04. Paperback. Used:Good. New York: Oxford University Press, 1983 book is tight with no markings, authors short inscription and signature on first page, mild soiling to page edges, dj has some rubbing and light soiling, edges have curling . Signed by Author. First Edition/First Printing. Hard Cover. Very Good/Very Good. 8vo - over 7¾" - 9¾" tall. Oxford University Press, USA, 1997-05-29. Hardcover. Good. New York: Oxford University Press, 1981. The definitive history of the Jackie Robinson years. A superb copy, clean and otherwise unmarked. Unclipped.. First Edition. Hard Cover. Fine/Fine. Illus. by Photographs. Octavo. Vintage. PAPERBACK. 039472593X Like New Condition. . Fine. Oxford University Press. Hardcover. 0195033000 Like New Condition. . Fine. Oxford University Press. PAPERBACK. 0195106202 Like New Condition. . Fine. New York: Oxford, 1983. 1st. Hardcover. Fine/near fine. Bound in the publisher's original quarter cloth and paper over boards, spine stamped in black & gilt. Dust jacket rubbed at the head and heel, small closed tear at the top fore-edge corner. Oxford: Oxford University Press, 1983. 8vo. 392 pp. Book condition: Fine. Dust jacket condition: Fine.. First Edition. Hardcover. Fine. New York: Oxford University Press, 1997. FIRST PRINTING of the First Paperback Edition. Biography of the first black baseball player to enter the major leagues, discussing his life, his times, the many white players who helped and guided him, the other black players entering the game at that level, the general opposition to black involvement in major league sports, much more. Wraps, contains notes, bibliography, indexed, 413pp. A very nice copy. Rare in this edition.. First Paperback Edition. Wraps. Near Fine. 8vo - over 7¾" - 9¾" tall. New York: Oxford Univ, 1983. Book. Very Good +. Hardcover. 1st Edition. A solid tight carefully read copy. This copy has some light soil, light foxing to the edges of the text block, a corner bump. The 16.95 priced jacket has some light edgewear, browning to reverse..
Oxford University Press. PAPERBACK. 0195339282 Special order direct from the distributor . New. Oxford University Press, USA, 2008-02-27. 25th anniversary. Paperback. Used:Good. NY:: Oxford University Press,. Near Fine in Near Fine dust jacket. 1983. Hardcover. 0195033000 . Third printing. Near fine in a near fine dust jacket. .
Oxford University Press, New York: 1983. Hardcover with dustjacket. Good condition. Front inside page has stains from newspaper clipping. ISBN: 0195033000. Oxford University Press. PAPERBACK. 0195339282 . New. Oxford University Press. PAPERBACK. 0195339282 Remainder mark . Fine. Baseball's Great Experiment: Jackie Robinson and His Legacy. NY: Oxford University Press, 1983. Book. Near Fine. Hardcover. Second printing. Octavo, sand colored cloth spine over black paper covered boards. 392pp. including extensive index. Illustrated with black and white photographs. A few small marginal pencil marks, else fine in near fine dust jacket.. Drawing on dozens of interviews with players and front office executives, contemporary newspaper accounts, and personal papers, Tygiel provides the most telling and insightful account of Jackie Robinson's influence on American baseball and society." List of chapter notes/sources. Bibliography. Index. . Expanded Edition. Softcover. Fine condition. xii, 413pp . Oxford University Press. PAPERBACK. 0195339282 Brand New! Not Overstocks or Low Quality Book Club Editions! Direct From the Publisher! We're not a giant, faceless warehouse organization! We're a small town bookstore that loves books and loves it's customers! Buy from us and you get great service as well as a great price! Your business is valued and your satisfaction is guaranteed! . New. OXFORD UNIVERSITY PRESS. GOOD CONDITION. HARDCOVER W/JACKET. New York: Oxford University Press, 1983. Hardcover. Very Good/Very Good. 8vo - over 7¾ - 9¾" tall. Oxford University Press, 1983-07-28. First edition, Complete Numbers . Hardcover. near fine/fine. NOT an ex library book. Green pinpoint dot on bottom edge of pages. Clean interior pages. Dust jacket has no chips or tears, price is not clipped. Oxford University Press, USA, 2008-02-27. Paperback. Good. Oxford University Press, USA, 1997-05-29. Paperback. Good.